I just saw the documentary I worked on with composer Gregg Lehrman at the DGA. I have never heard so much music on a film. After the screening I turned to him and he said “It was like I scored a Music Video” He did a fantastic job covering all that ground moving seamlessly from scene to scene. The filmmakers have spent the past 3 years traveling to some of the world’s most violent locales in order to make this documentary on Somali piracy, STOLEN SEAS. 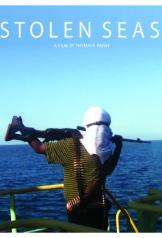 Utilizing exclusive interviews and unparalleled access to real pirates, hostages, hostages’ relatives, ship-owners, pirate negotiators and experts on piracy and international policy, Stolen Seas presents a chilling exploration of the Somali pirate phenomenon. The film throws the viewer, through audio recordings and found video, right into the middle of the real-life hostage negotiation of a Danish shipping vessel, the CEC Future. As the haggling between the ship’s stoic owner Per Gullestrup, and the pirate’s loquacious negotiator, Ishmael Ali, drags on for 70 days, these two adversaries’ relationship takes an unexpected turn and an unlikely friendship is born. STOLEN SEAS is an eye opening refutation of preconceived ideas on how or why piracy has become the world’s most frightening multi-million dollar growth industry.